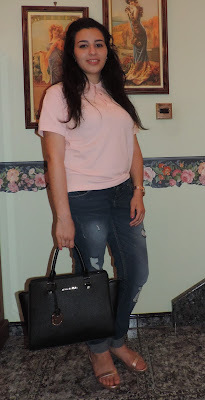 Lourdes Gio's Blog: Outfit Post: Casual, Smart and Comfortable. Did you ever find that you have one pair of jeans that is so comfortable that you want to wear it everyday? Well, this is what happened to me a couple of times. And recently I found the perfect pair for such a bargain. This pair of jeans is from Terranova and with it I wore a light pink Ralph Lauren polo t-shirt which I tucked in from one side. The jeans has a medium wash and it is also ripped. For this look I rolled up the ends. The black handbag is from Michael Kors and I love it so much because it holds a lot in it. The lovely rose gold sandals are from New Look. I wore this outfit for day 2 of Mercedes-Benz Fashion Week Malta last Sunday. I chose this look because it is nice, comfortable and also smart. Also because in the evening the weather gets a little bit chilly, the venue grounds are not that great for heels and there is a lot of walking to do.